Derma rollers are used for a treatment process called micro needling or skin needling. It is used mainly in the treatment of acne, scars and pits, stretch marks, wrinkles and for skin rejuvenation. 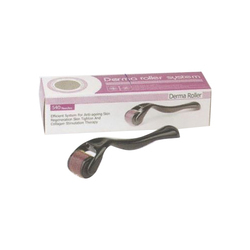 we have a wide range of derma rollers in diffirent sizes. We are proficient name in the industry, involved in offering optimum quality of Micro Derma Roller. Handle - medical grade fibre. Ice roller for face and eye, Puffiness, Migraine, Pain Relief and minor injury, skin care products. A derma roller is a device that is outfitted with dozens of what is often labelled “surgical-grade needles.